Australia’s fastest thoroughbreds are set to burn down the Flemington straight this Saturday in the aptly named Lightning Stakes, a race that put the Inglis Premier Yearling Sale on everyone’s wishlist thanks to the record breaking feats of Black Caviar. There are numerous links between this year’s running of the Group 1 VRC Black Caviar Lightning and the upcoming Premier Sale, with the sires of 35 yearlings to be auctioned at Oaklands represented by runners in the $750,000 race. 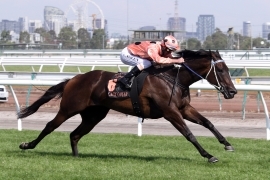 Black Caviar was purchased from the 2008 Inglis Premier Sale for $210,000 and went on win all 25 races she competed in, including three Lightning Stakes. In her third victory in the time-honoured sprint the world champion broke Special’s 25 year-old track record in a winning time of 55.42 seconds – a swift benchmark for this year’s field of seven to chase. The great mare’s buyer and trainer Peter Moody will saddle up the lightly raced colt Kinglike in the 2016 Lightning. Exosphere holds favouritism for Saturday’s race and his sire Lonhro is represented with six yearlings in the Premier Sale catalogue, while the sires of his major rivals Chautaqua (by Encosta de Lago), Delectation (by Shamardal) and Japonisme (by Choisir) are also represented in the upcoming Melbourne Sale. Black Caviar’s breeder Rick Jamieson will be offering a draft of nine yearlings under his Gilgai Farm banner at the Premier Sale, including a filly by Black Caviar’s champion half-brother All Too Hard, which has no less than 20 first-crop yearlings in the catalogue. Other yearling’s by All Too Hard in the sale include daughters of the great Makybe Diva and Headway, which won at Group 1 level down the Flemington straight. Swettenham Stud had the honour of selling ‘Nelly’ on behalf of Gilgai in 2008 and Adam Sangster’s operation have a large quality packed draft of 40 yearlings to sell this year from Sunday 28 February to Wednesday 2 March.